Phonepole-Glow, originally uploaded by sammo371. I have this thing about shooting telephone poles. No clue as to why. I'm sure this will be one of many telephone pole images to follow. 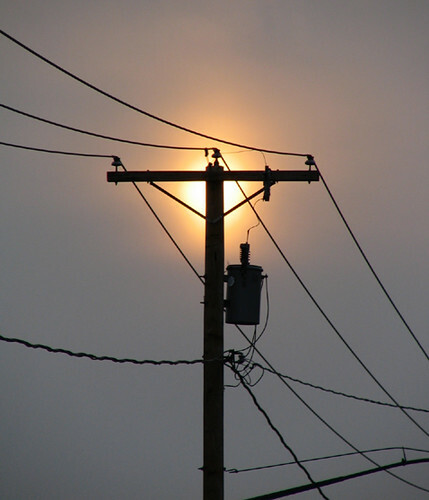 People often ask me how I got the sun to pose behind the telephone pole. I tell them harnessing the power of the sun is a lot like harnessing the power of a 4 year old. I learned this valuable skill while working at the Sear’s Portrait Studio. Energetic 4 year olds need a way to channel their energy in order to have their likeness taken. The best way to do this is a romping game of hide and seek. This wears them down quickly while giving the photographer the opportunity to take photos when they become calm and submissive. Taking this photo worked in exactly the same way. The sun and I played a romping game of hide and seek. The sun enjoyed hiding behind clouds but, at one point it became submissive enough that it agreed to hide behind the telephone pole. Just like a 4 year old, shortly after I took this photo the sun got tired and went down. I also often get asked why I choose hide and seek over peek-a-boo. To me peek-a-boo is a lazy man’s hide and seek. It requires little effort other then covering your face with a blanket or other foreign object. When I play hide and seek it shows that I’m physically committed to getting the shot and the subject respects this. I think most people, at least on a subconscious level can spot photos where the photographer chose peek-a-boo over hide and seek. The subject just looks more detached. It’s a sad commentary on photography. Depressing really. So much so that sometimes I wonder if a career at Sear’s Portrait Studio was a good idea. Well, Timm Grimmer said I really ought to check this out. I think that this picture alone, with the accompanying text comparing Old Sol to a four year old at Sears, was worth the trip. It's difficult to determine what might resonate with a person. So I'm glad you connected with this post.